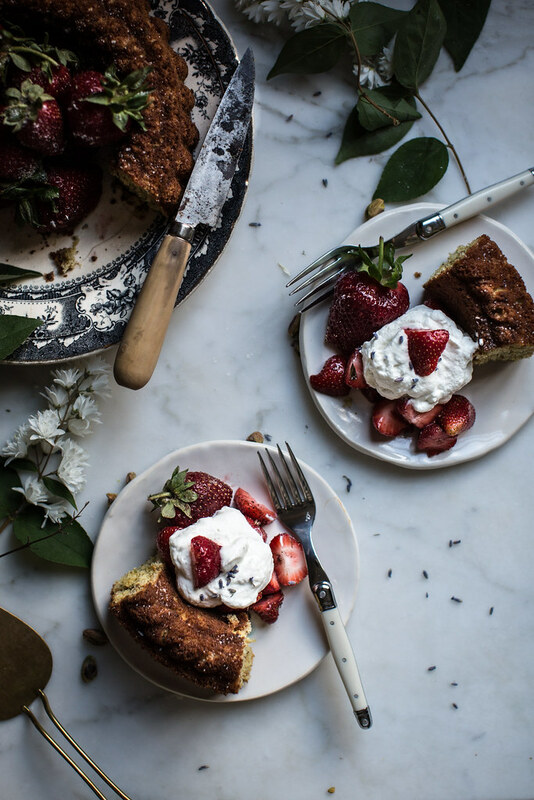 Today I have a recipe from Yossy Arefi’s new seasonal baking book “Sweeter Off the Vine” for you: a tender pistachio poundcake topped with lavender sugar macerated strawberries. 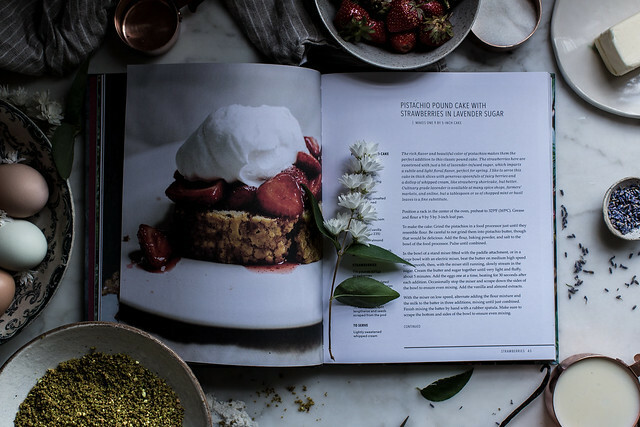 The book is a celebration of baking with ripe, seasonal fruit from rhubarb to plums, and it’s full of flavor combinations that leave you rushing to the kitchen/kicking yourself for not thinking of them. I had the pleasure of meeting Yossy on a trip up to NYC a couple of years ago over dinner, but before that we’d known each other through the good old food blogging community. She gave me tips for shooting film when I was just starting out, and I was a huge fan of her blog, Apt. 2B Baking Co., recipes and photos both. They have an easy going quality to them. They’re simple and rustic but never precious and never contrived. Just like her book. When she sent me her cookbook in all it’s finished glory, I couldn’t be more excited about it and for her. 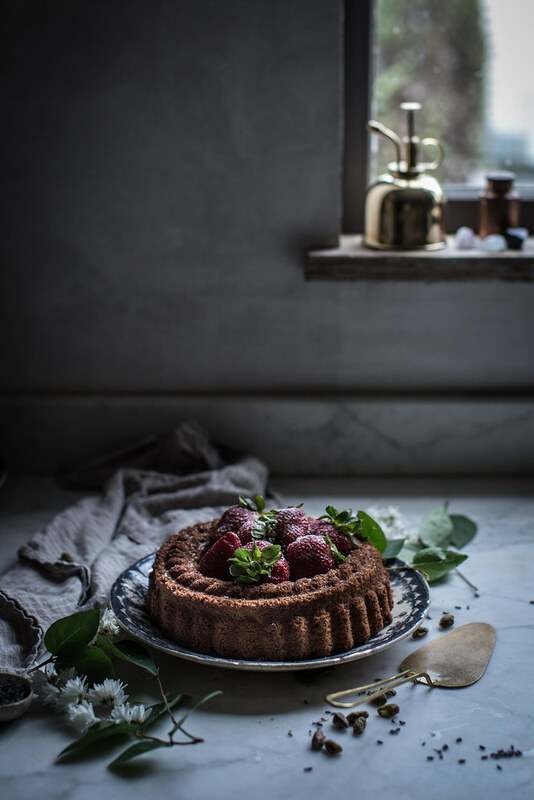 It’s full of the sort of combinations I love, little unexpected twists like pistachio in poundcake or pink peppercorns in raspberries that lend a je ne sais quoi to her recipes. Her creativity isn’t for the sake of creativity—the flavors truly work & harmonize. 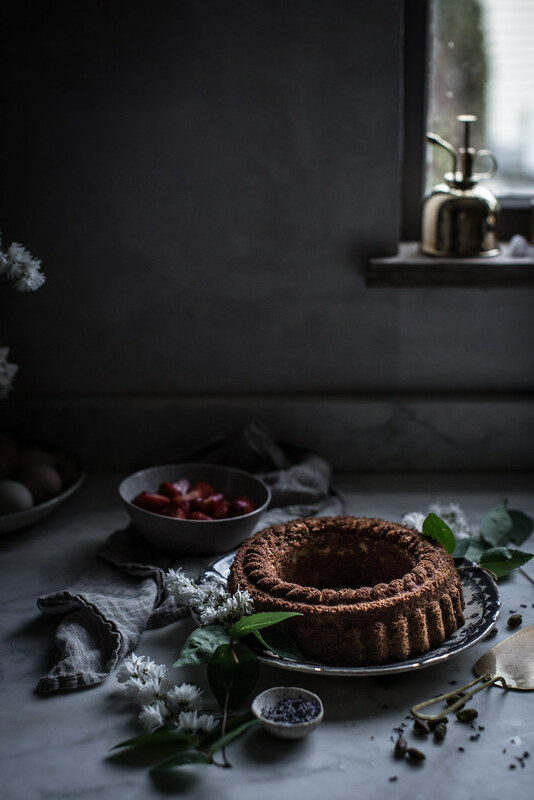 She’s a fabulous photographer and blogger, but I love her most of all because she’s a baker through and through. Her recipes don’t stop at being beautiful, and her flavor combination aren’t merely poetic sounding: they’re delicious. Simply amazing. This pistachio poundcake is one such recipe. And it’s deceptively simple. I’ve made hundreds of poundcakes. But this one is the best. Truly. It didn’t last more than 24 hours in our house. I can’t wait to make it at retreats and for guests in our home. 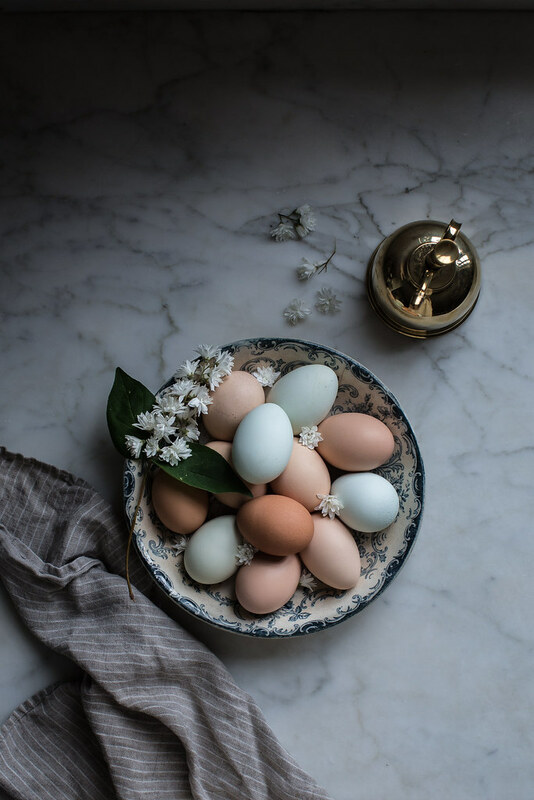 Best of all the recipes in her book are arranged by the fruits of each eason so it’s a simple matter to find multiple ideas for whatever happens to be turning up at your market. I’m desperate to try the campari + strawberry popsicles too…pure genius. You can grab a copy of her book here. I highly recommend it. While there are a lot of books out there, few are reliable. I haven’t made a bad dish out of this one. And I don’t find myself subtly tweaking things. Which is highly out of character. These are perfect right off the page. Also check out the gorgeous video trailer they made for the book below. If this recipe and my shameless gushing don’t make you want it, the video will. And keep on scrolling for the recipe at the bottom of the post. 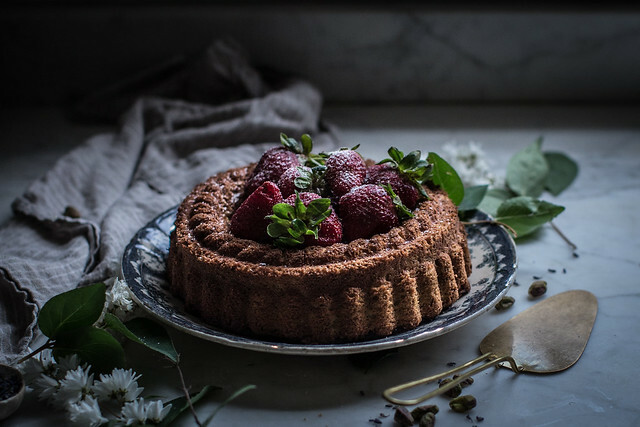 Make this cake before strawberries are gone for the year! This recipe is from Yossy Arefi's cookbook "Sweeter Off the Vine". Make sure you put your dairy out a bit before you intend to bake so everything is room temp and ready to go! Best poundcake I think I've ever made. Position a rack in the center of the oven, and preheat to 325ºF (165ºC). Grease and flour a 9x5x3-inch loaf pan. To make the cake: Grind the pistachios in a food processor just until they resemble flour. Be careful to not grind them into pistachio butter, though that would be delicious. Add the flour, baking powder, and salt to the bowl of the food processor. Pulse until combined. In the bowl of a stand mixer fitted with the paddle attachment, or in a large bowl with an electric mixer, beat the butter on medium-high speed until smooth; then, with the mixer still running, slowly stream in the sugar. Cream the butter and sugar together until very light and fluffy, about 5 minutes. Add the eggs, one at a time, beating for 30 seconds after each addition. Occasionally stop the mixer, and scrape down the sides of the bowl to ensure even mixing. Add the vanilla and almond extracts.? With the mixer on low speed, alternate adding the flour mixture and the milk to the batter in 3 additions, mixing until just combined. Finish mixing the batter by hand with a rubber spatula. Pour the batter into the prepared pan, smooth the top, and bake until the cake is golden brown and a wooden pick inserted into the center comes out clean, 45 to 55 minutes. Cool for 15 minutes in the pan, then remove the cake to a rack to cool completely. 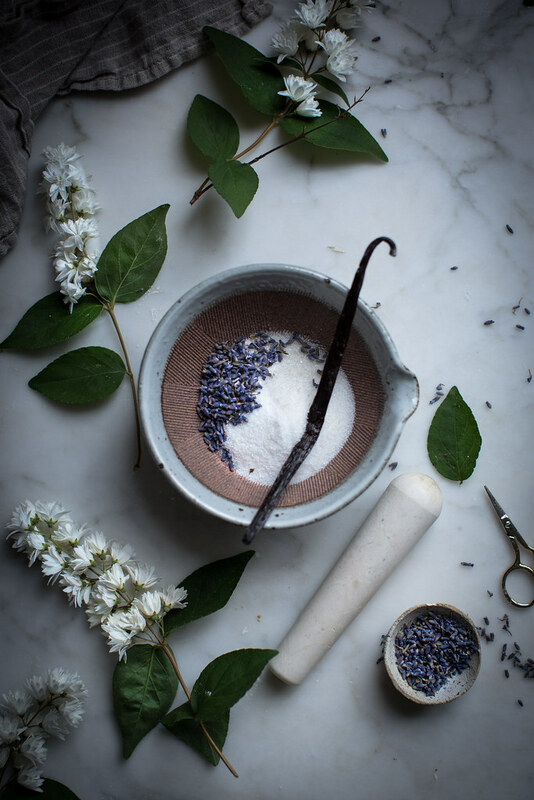 To make the strawberries: Combine the sugar, lavender, and vanilla seeds in a mortar, and grind with a pestle until the lavender? is broken up into fine bits and the sugar is fragrant. Alternately, this can be done in a food processor. Hull and slice the strawberries in half if they are small, in quarters if they are larger; combine the sliced strawberries and sugar in a bowl and stir gently. Let the berries macerate for at least 15 minutes at room temperature before serving. 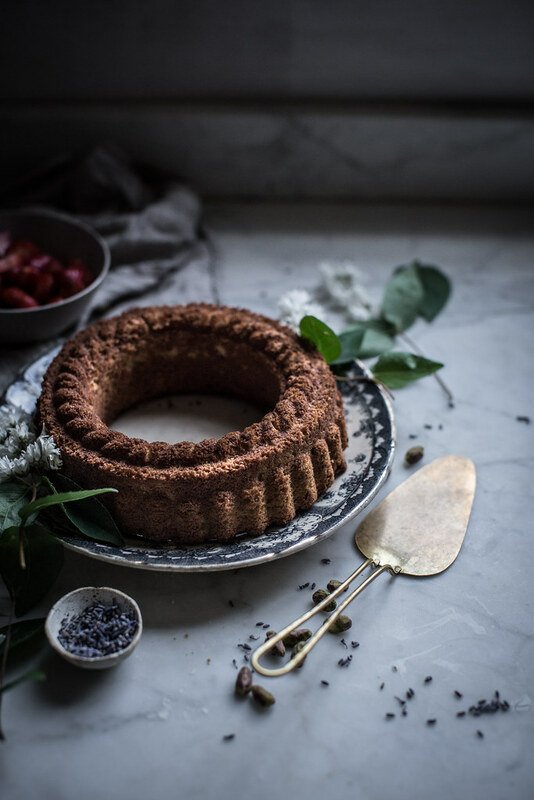 To serve: Slice the cooled cake into thick pieces, and top each slice with a generous spoonful of berries and their juices. Top with whipped cream. Extra cake keeps in an airtight container at room temperature for 3 days. 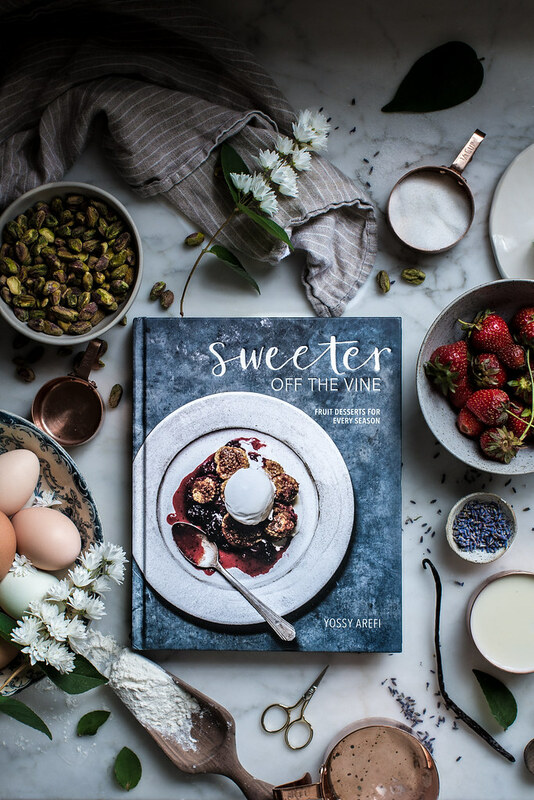 I just got my hands on Sweeter off the Vine and have the wonderful problem of not knowing what to make first. This looks like a fantastic first attempt. What a sweet tribute to your friend, and a compelling recipe. I love hearing about your friendships built through food blogging. I wrote a book review of a fellow blogger’s new release last month, on yet a third blogger’s site as a guest post! I love how our niche communities give round and round (mine is nature writer bloggers). I love anything with pistachios! This cake looks wonderful! beth, I would love to make this cake! Can you please let us know what size pan and how to prepare it? Thanks! That video is so fantastic, it makes all of the fruit look so appealing and now I know how to easily pit cherries too! Your cake is fantastic and I love the shape of the bundt tin. Hope you’re enjoying France. I have only heard great things about this book, so it is one to go on my wish list, if only to judge by this amazing looking cake!!! I love the idea of pistachio in the cake, I never used it that way, only in meat loaves and meatballs!! Your picture are so so so amazing! The recipe looks quite easy and with a high impact and, of course, super delicious! Thank you sooo much! Hi Beth, you mentioned (on snapchat, I think) that you would post a list of what you packed for your trip. Are you still planning on doing so? If so, it would be an incredibly useful resource for me, since I’m going on a month-long trip to Europe this summer. I did not expect for that video to literally get me so hungry at almost midnight. Everything looked so elusively delicious. Unbelievable. And I can’t imagine how great this pistachio combo is! I’m a huge pistachio fan and I should be, since it’s one of my favorite ice cream flavors after all. Beautiful feedback to what looks like a wonderful book, Beth! 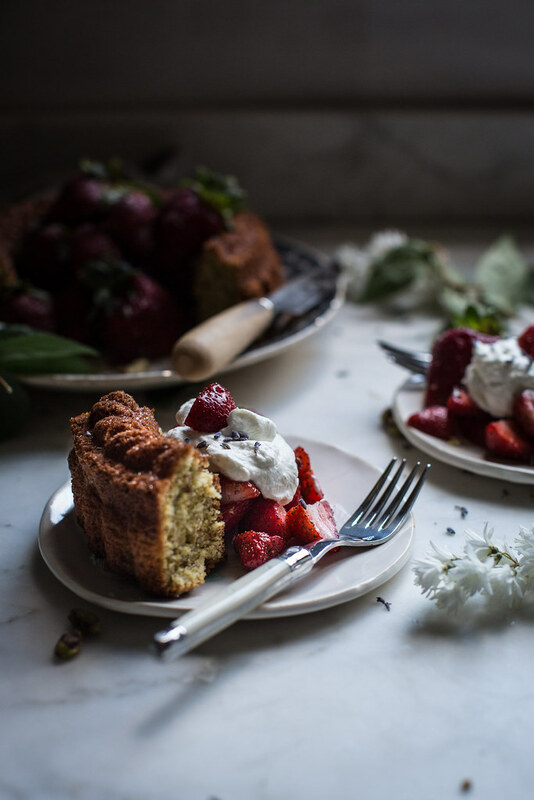 I like this pistachio cake with strawberries! Great recipe! I try to cook it! Hi Beth! Im just amazed and in love with your photography & styling skills, do you have plans somewhere in the future to have a workshop in Scandinavia? Thank you so much! We are doing one in Sweden this year but sadly it is sold out! Next year we are looking at both Iceland and Norway as potential destinations so if everything goes as plan we should be back in Scandinavia next summer hosting a retreat in June or July. You can join our mailing list at localmilkretreats.com to stay up to date! I want one piece of that cake. Your photos are great. I’m not someone who usually looks at cooking blogs, despite my deep love of baking. However, I keep returning to your website to read more and more of your recipes and adventures. I think it’s because so many of your desserts have that wildflower, woodland element. I just made your honeysuckle cordial as I grew up in near the woods of Pennsylvania and always wanted to preserve that smell somehow, and I’m so excited to use it! I plan to make lavender and rose as well, and keep them in beautiful bottles to use in more recipe…including rose margaritas. I also love your travel photos, having lived in Japan for over two years I remember those sights you’ve captured, along with the smells and sounds that come with them. More than anything else, those photos made me miss Japan! I hope you get to visit Turkey someday, as it’s half my heritage and I’ve also lived there a year. I’d love to see what you’d find in Istanbul! I love every tiny detail of your work. Thanks for being such an inspiration! Hi Beth, I’ve followed your blog for a couple of years now and finally took the leap and registered for your Nashville workshop. It’s close enough and affordable enough for me to do and yet still a big commitment for a novice/hobbyist who’s just coming for the sheer excitement and admiration and curiosity. I would love to some day attend a retreat. Congratulations to the little empire you’re building not to mention the little person . . . I just sent my son to college and time flies . . . you are in for the ride of your life, such a joy. I am just wondering, with your distinct voice and your poetic and introspective style of writing, would you ever consider or are you even now in the process of writing a book yourself? I do think it would be so wonderful! Ok, cheers and see you in July!!! The recipe looks pretty easy considering that the cake looks so delicious. Will try this soon enough and I got to get a copy of Yossy’s book. Looks like a gem.